Our innovative industry leading data destruction services are available to current and potential clients located throughout the Mayo Region. Our paper shredding services are available throughout the Mayo Region of Ireland including towns such as Castlebar, Balla, Wesport, Foxford, Kilmaine, Claremorris, Charlestown, Kiltimagh, Neale, Ballina and Crossmolina just to name a few. Our shredding services are made up of Onsite Paper Shredding, Offsite Paper Shredding, Onsite Document Destruction, Offsite Document Destruction, Products Destruction and Electronic Media Shredding (Hard Drives C.D.’s etc). Our award winning business is a highly secure confidential shredding company with a 100% unblemished record and 10 years’ experience in providing top of the range innovative service deliveries within the private and public sectors. We have great pride in improving the service quality within the data destruction industry through increasing shredding standard available to clients and designing and implementing innovative service methodologies. Since 2004 we have made huge improvements to the Irish Confidential Data Destruction Industry and increased the service quality available to Organisation within Ireland. This trend is guaranteed to continue into the coming years as we proceed through our specialised company planning and targets for the future in order to make Ireland one of the safest and secure Countries for an Organisation to conduct their business in. Our reliable Onsite Paper Shredding Services cater for all clients within the Mayo Region. We guarantee full confidentiality and security with all of our paper shredding service deliveries providing total peace of mind which in turn provides the client additional time to allocate to their daily work schedule. The responsive shredding service delivery entails one of our paper shredding units arriving onsite at the Client’s location on schedule in order to provide the highest level of confidentiality during delivery. The innovation within our onsite paper shredding service delivery results in the total destruction of the client’s confidential material while our specially trained shredding staff are not required to touch, feel or see any of the sensitive material. This is one the factors that establish the fact that our shredding systems are the most secure and confidential shredding systems operating within the market. The fully automated shredding technology that Security in Shredding operate within their paper shredding services is an additional example of how we have increased the level of security & satisfaction provided to the client (About us). Post every service delivery the client is provided with assurance through fully traceable and auditable certificates of destruction and recycling illustrating the clients compliance with waste and data protection Acts. 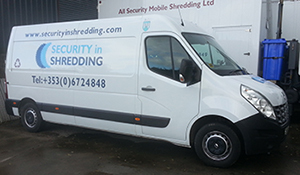 At Security in Shredding the client is our highest priority and we ensure to work in line with all of the client’s needs and requirements in order to build a strong working relationship (Testimonials available upon request). Paper Shredding “Clear Out” Services and “Purge” Services Mayo Region Ireland. Onsite Paper Shredding Services and Offsite Paper Shredding Services at Security in Shredding provide our client’s with total peace of mind. We also offer paper shredding clear outs “Purge” shredding services for clients within the Mayo Region. Both large and small quantities of confidential material are catered for destroying it beyond both recognition and reconstruction. This responsive shredding service caters for client’s needs through both our Offsite Paper Collection & Same Day Shredding Service delivery and our Onsite Paper Shredding Service delivery. No job is too big or too small for Security in Shredding, it can be a store full of confidential material or a small number of boxes Security in Shredding are your number one service provider to provide high security confidential shredding. All of our confidential paper shredding services enables the client to decide upon an option of secure receptacles. Secure Consoles, Secure Storage Sacks and/or Secure 240 Litre Receptacles are available Please see our Product List for further information in relation to our products.